One of the major advantages we humans have traditionally had over robots is our fairly refined sense of touch. Scratch that off of the list, though, because a team of researchers at the University of Southern California’s Viterbi School of Engineering have created a robot that can outperform humans in the task of identifying materials. 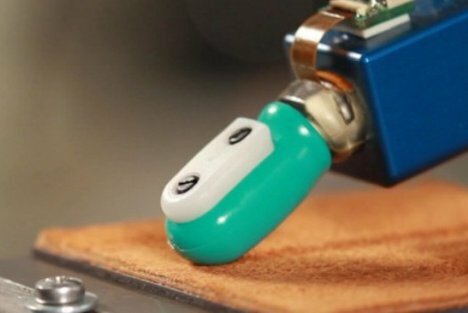 The bot is equipped with a tactile sensor that mimics the human fingertip. A bone-like core is covered with a sensor called BioTac over a liquid filling. The “fingertip” also has fingerprints which enhance its sensitivity to textures. The bot is programmed to perform exploratory movements in order to identify a wide variety of materials. Humans perform these types of movements whenever we are trying to figure out what an object is. The difference is that the robot does it much, much better than us. Of the 117 materials that it was trained to recognize, the bot identified the correct one 95% of the time. It outperformed humans who were stumped by materials with similar textures. The super-accurate, sort-of-creepy robot could be an important step toward improving prosthesis technology, ushering in a new generation of prosthetic limbs with the ability to feel.